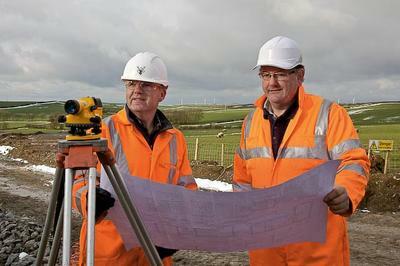 (LtoR) Phil Wooster, Ysgellog Site Manager, Raymond Brown Construction and Hywel Pritchard, Senior Partner, Pritchard Brothers, Rhosybol at Ysgellog Farm. The two new wind turbines at Ysgellog Farm on Anglesey are turning thanks to Welsh and Anglesey businesses. Final analysis of the figures has shown that Welsh companies that worked on the construction phase of the project provided goods and services to the value of £646,000. "Our intention was to use local suppliers and employ local people on site whenever possible. I am pleased to report 71% of our suppliers were Welsh and 35% were from Anglesey, which represents a £316,000 spend on Anglesey," said Richard Mardon, Chief Executive Officer, Airvolution Energy Ltd.
A wide range of companies within Anglesey were involved in the construction phase, including aggregates and concrete suppliers, building contractors, hotels and restaurants, and providers of fuel, fencing, tool hire and building materials. The positive economic benefits for Wales from onshore wind were highlighted in a recent report by Regeneris Consulting and Cardiff Business School, January 2013. It found that £2.3 billion GVA, the gross value of goods and services, could be added to the Welsh economy between 2012 and 2050 if the Welsh Government’s 2025 ambition of achieving 2,000MW of onshore wind is realised. 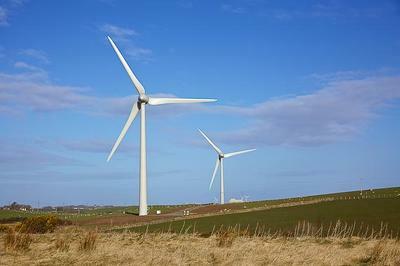 The report was commissioned by the wind energy industry in Wales, RenewableUK Cymru, and the Welsh government. Ysgellog Farm show how using local suppliers makes good business sense and brings an economic benefit directly to Anglesey. In addition to the commercial benefits, we have also committed to deliver over £415,000 to local community projects over the 25-year operating period of the turbines," says Richard. Pritchard Brothers are based just 2.5 miles from Ysgellog Farm and built the substation building on the site. "This contract has been invaluable to us. We have made more contacts and have secured more work because of it. We enjoyed working on the site. All our workers lived just six miles away, which meant enjoying an extra panad in the morning," said Hywel Pritchard, Senior Partner, Pritchard Brothers, Rhosybol. Aggregates were supplied from the CMP Plant/DP Williams quarry at Brynteg and Hogan Aggregates Caer Glaw Quarry at Gwalchmai. "Thanks to a very committed team, construction went according to schedule despite the challenging conditions of last winter. We are pleased to have received positive feedback from local residents since the two turbines have started operating," says Richard. The two turbines at Ysgellog Farm are 92.5 metres to blade tip, and are estimated to generate enough electricity to power the equivalent of 3,100 homes each year. Construction started in October 2012 and the turbines started generating electricity in March 2013. Construction of such complex structures and entrusted in the hands of the most skilled and the most experienced for a reason. There is no room for any mistakes cause a lot of life depends on it. Be extra careful if you are connected to such projects.